This is a new and somewhat unfamiliar season of life for us, to be honest. It's a season of saving pennies and stretching dollars - something we didn't have to do quite as carefully our first three years of marriage. In an effort to be mindful of our resources and not be too overwhelmed, we shaved the money off of specific areas in our budget. We were DVR addicts. I recorded so many seasons of reality shows just because I could. And then I would binge-watch those shows or become overwhelmed that there was not enough time to ever catch up on those shows. And when Chris and I would be home together at night, we would find ourselves watching TV just because it was right in front of us. Since cutting cable, we shaved $100 off our budget. Instead, we kept wi-fi and purchased an Apple TV for $99 (a one-time cost that we were already spending on one month of cable anyway). We are also able to pick up a few local channels without having paid cable. Now, with those local channels and the Apple TV, we are able to watch the shows we like and be more intentional with our downtime. 2. We got down to one car. We recently became a one-car family. Besides the automatic savings of close to $500 a month, it has continued to make our time together more intentional and has allowed us a lot more time together, whether it's in the car or out running errands. We now rely on specific schedules, our synced iCalendar, and the light rail/bus system. I completely understand that getting down to one car doesn't fit everyone's schedule and commute, but it's working for us at the moment, so we're going with it. 3. We use coupons and search for great savings. I've been using coupons for a few years now, both for groceries and activities. I save around $20-30 per grocery trip with just the coupons alone (not including additional store savings or sales). We get a lot of our toiletry items for free this way - toothpaste, toothbrushes, soaps, shaving creams. I cringe just thinking about paying full price for those items. In fact, my husband also joined the Dollar Shave club where he receives high quality razors every month for just $6 flat. 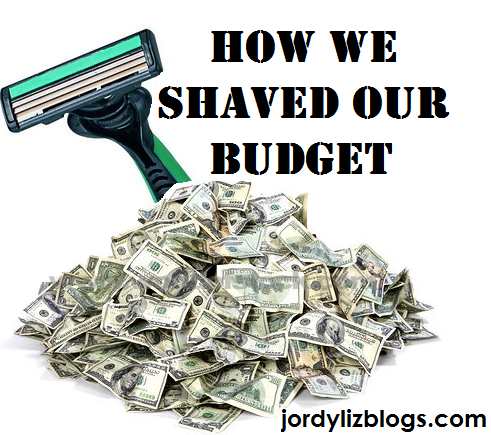 We were spending that same amount on razors almost every two weeks - even with coupons! I also make sure to clip any coupons for restaurants. You know the ads that come in the mail that we typically just toss? There are so many buy-one-get-one-free coupons in there, which make our date nights a lot more reasonable. By planning out our meals for the week and creating a grocery list, I am able to stick to our grocery budget. Instead of wandering into the store grabbing anything that looks good or reasonable, I stick to the list and come home with food I know will be put to good use. I attribute a savings of at least $25 a week to meal planning, because we are not running out to grab food last-minute or throwing tempting items in the basket. 5. We just say no. A big part of saving money is learning how to say no to things that are just not doable at the time. We have had to say no to trips, vacations, eating out, big purchases, not-so-big purchases, and outings. Some things we have said no to is because by the time we add up the gas, hotel cost, and food cost, it's just not within our means. It makes you think twice about what really goes into the night out or the weekend away. What are areas you have had to shave to save money?